Dean (2005) described the status of the Sickle-winged Chat Cercomela sinuata as resident with some altitudinal movements from the Drakensberg escarpment to the lower Lesotho and KwaZulu-Natal areas. These represents mostly C. s. hypernephela (Dean 2005) and this species’ geographic variations are not discussed in Chittenden et al. (2012). Brown & Barnes (1984) first described these movements on the Alpine belt on the Drakensberg escarpment to adjacent lower altitudes. Harrison (1997) described their status (during SABAP1 surveys) with lower summer reporting rates and with winter increases in the central western parts of their distribution (Zone 3 on SABAP1 distribution map) which includes most of the central and western Free State. Harrison (1997) also suggested a seasonal movement into and out of the winter rainfall succulent Karoo areas. During fieldwork for both the SABAP1 and current SABAP2 bird atlas projects (and BIRP projects), I observed winter seasonal influxes of Sickle-winged Chats in the central parts of the Free State. These winter increases were mostly observed during the April – August period when this species was observed in abundance in its preferred habitat. It is still uncertain from where these individuals originate, but the SABAP2 data will possibly support / explain the suggestion of seasonal influx into and out of the winter rainfall areas of the succulent Karoo to the central parts of their range (Harrison 1997). The aim of this paper is to analyse the winter / summer seasonal distribution of the Sickle-winged Chat and to analyse its monthly occurrences in certain selected degree grid cells (DGCs). This paper will focus mainly on the central and western Free State and areas in the Western Cape and southern Eastern Cape where seasonality is also suspected to occur. The distribution of Sickle-winged Chats is presented as winter (April – September) (Figure 1a) and summer (October – March) (Figure 1b) patterns and the higher reporting rates during winter in the central Free State are clearly noticeable (see explanations in Underhill & Brooks 2016). Also the map shows some differences in seasonal reporting rates in the Western Cape and southern Eastern Cape areas. 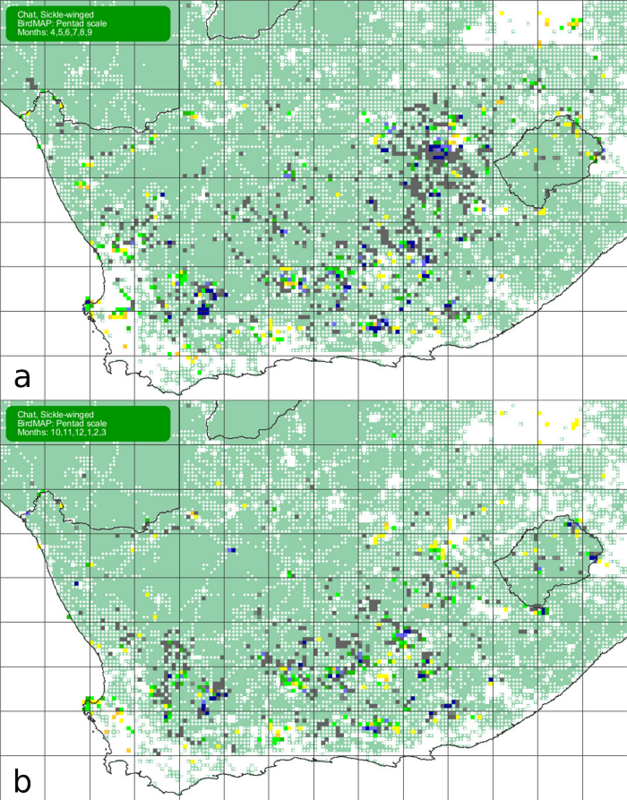 Figure 1: SABAP2 distribution maps for the winter (a) and summer (b) months for the Sickle-winged Chat, downloaded on 19 April 2017. The higher winter reporting rates (a) in the central parts of Free Sate differ noticeably from the lower reporting rates of the summer map (b). The detailed interpretation of this map is provided by Underhill & Brooks (2016) and see text. There are no data from pentads shaded turquoise. Pentads with white dots have fewer than four checklists but the species was not recorded. Pentads with four or more checklists are either shaded white, species not recorded, or in colour, with shades based on reporting rate: yellow 0-7.9%, orange 7.9-17.0%, light green 17.0-28.9%, dark green 28.9-44.8%, light blue 44.8-64.9% and dark blue 64.9-100%. In the central and western parts of the Free State peak reporting rates were recorded in 6 DGCs mostly from April / May to August / September (Figure 2). Lower summer occurrences were also noted. In the more southern Free State (areas along the Gariep River) in DGCs 3024, 3025 and 3026 (not shown in Figure 2), Sickle-winged Chats were recorded in all months, with some summer peaks. During the Birds in Reserves Project (BIRP) which started in 1992 (after SABAP1), there was also a March / April – September peak in reporting rates recorded at Soetdoring and Willem Pretorius Nature Reserves (De Swardt 2000), which supports the SABAP2 data presented in Figure 1a & b. Also, BIRP data from Tussen-die-Riviere Game Reserve near Bethulie (which is along the Gariep River) show a summer peak from August – November. Figure 2: Bar graphs of degree grid cells (DGCs) in the central and western Free State showing the monthly seasonal patterns of occurrence of Sickle-winged Chats. Note the absence or low reporting rates during the summer months (October – March). In parts of the Western Cape (see Figure 1a & b) winter to early summer peaks were recorded during SABAP2 (Figure 3). In DGCs 3024, 3025 and 3026 low to high winter peaks were complimented by higher summer reporting rates to early summer reporting peaks during SABAP2 (not shown in Figure 3). In DGC 3324 (not shown in Figures 2 or 3), in the southern Eastern Cape, Sickle-winged Chats were recorded during all months of the year with an August peak, but the seasonal difference in Figure 1a & b is also noticeable. More distribution data are still needed in several DGCs in the Sickle-winged Chat distributional range, especially in low coverage areas. 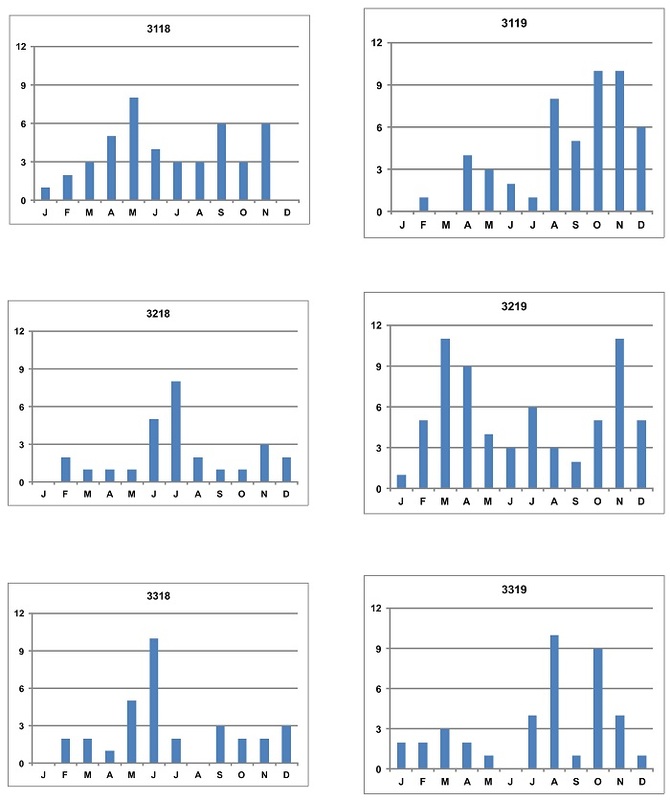 Figure 3: Bar graphs of degree grid cells (DGCs) in the Western Cape areas showing the monthly seasonal patterns of occurrence of Sickle-winged Chats. Note the higher reporting rates during the summer months and also late winter peaks in some areas. This is the first time that the seasonal occurrence of Sickle-winged Chats has been analysed based on SABAP2 distributional data, and supports the suggestion that this species is not only resident in certain areas of its range, but that seasonal movements do occur (see Dean 2005, Harrison 1997). It is also the first attempt to analyse the winter influx of Sickle-winged Chats to the central and western Free State based on SABAP2 data, personal observations during the various atlas projects, and earlier published observations (see De Swardt 2000). This study also supports Harrison’s (1997) speculation that movement of this species does occur into and out of the winter rainfall succulent Karoo and the Western Cape areas. Oatley (2017) further recorded Sickle-winged Chats as breeding in the higher altitudes of Lesotho and recorded the species on rare occasions in the Drakensberg foothills in winter. Oatley (2017) further noted and suggested that this species’ migration is mostly westwards towards the Free State, which is supported by the SABAP2 data and personal observations in this study. A total of 36 Sickle-winged Chats have been ringed so far, most of them in Lesotho, KwaZulu-Natal (Sani Pass areas) and in the Eastern Cape. There is only one ringing record from the Glen area in the central Free State. Also, only one recapture has been obtained with no movement recorded for the individual. A colour ringing study on this species is needed to unravel their seasonal occurrence in the central Free State and other parts of their range. Thanks due to all the Citizen Scientists who submitted SABAP2 cards with Sickle-winged Chats on their lists, and to Les Underhill for producing the Sickle-winged Chat summer / winter maps for this manuscript. Brown CJ, Barnes PR 1984. Birds of the Natal Alpine belt. Lammergeyer 33: 1-13. Chittenden H, Allan DG, Weiersbye I 2012. Roberts geographic variation of southern African birds. John Voelcker Bird Book Fund: Cape Town. De Swardt DH 2000. The birds of Soetdoring Nature Reserve and adjacent areas, central Free State. BirdLife South Africa guide pp. 1-40. BirdLife South Africa: Johannesburg. Dean WRJ 2005. Sickle-winged Chat Cercomelia sinuata In: Hockey PAR, Dean WRJ, Ryan PG. (Eds). Roberts – Birds of Southern Africa (VIIth Ed) Cape Town: The Trustees of the John Voelcker Bird Book Fund. pp. 952-953. Harrison JA 1997. Sickle-winged Chat. In: Harrison, J.A., Allan, D.G, Underhill, L.G., Herremans, M., Tree, A.J., Parker, V. & Brown, C.J. (Eds.). The atlas of southern African birds. Vol. 2, pp. 180-181. Johannesburg: BirdLife South Africa. Underhill LG, Brooks M 2016. Pentad-scale distribution maps for bird atlas data. Biodiversity Observations 7.52: 1-8.